New MHSc graduate Terrance Patterson has another reason to celebrate. The father of four and Canadian Armed Forces member, was recently honoured as the 2018 University of Toronto recipient of the Robert Wood Johnson Award. Johnson & Johnson Medical Inc established the awards in 1956, which are presented annually to six deserving students from Canadian universities who are pursuing a Masters of Health Science in Health Administration degree. 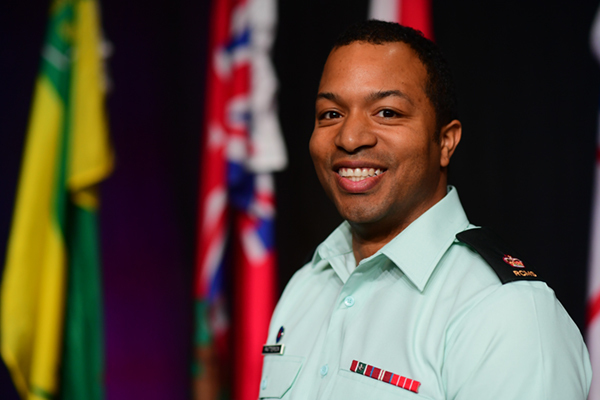 Each award recipient is expected to make a valuable contribution to the health services industry, something Patterson has already been doing throughout his time as an officer of the Royal Canadian Medical Services with the Canadian Armed Forces. For over 15 years Patterson has been a member of the Forces, having joined right out of highschool. He earned his BA in Sociology and experienced his first post as a Support Services Officer in a Canadian Forces Medical Clinic. Since then he has worked in various roles. During his deployment to Afghanistan he was the Senior Medical Mentor to the Afghan National Army. He has also worked as the Company Commander in a Field Ambulance Medical, and as a Support Services officer at the Canadian Forces Health Services Training Centre. Patterson’s next post will see him as the Medical Planner for 1 Canadian Air Division, in Winnipeg. The range of duties has certainly provided Patterson with a wealth of experience, but now with the MHSc degree in hand, he is eager to return to the clinic setting in the role of Clinic Manager. Base medical clinics are like robust outpatient clinics, Patterson says. They are a vital component of the Canadian Armed Forces and include not only general physicians but also mental health, diagnostics, physical therapy and more. They are considered a primary care system for service members, with a goal of keeping the population healthy and able to deploy if needed, whether to support domestic or international operations. “Becoming a clinic manager is a milestone goal of mine, and one of the reasons I chose to pursue a graduate degree at the Institute of Health Policy, Management and Evaluation,” he said. The program, Patterson says, provided him with an opportunity to learn about his strengths and weaknesses, and how to collaborate with multiple stakeholders to reach a common goal. Change in the clinic setting, can come in the form of digitizing information systems, or highlighting efficiencies that affect the quality of care delivered to patients, both areas that Patterson witnessed during his first few years on the job. “It was eye opening to watch the change leadership in place at that time, there was so much more at stake than simply making health records digital, this was fundamentally changing clinic operations, although the goal of delivering quality health services always remained a priority,” said Patterson. The Canadian Armed Forces supports professional development in health administration through a sponsored program that allows two members to complete a health administration degree at a Canadian university of their choice. That was important to Patterson, who as a father to four children ranging in age from 11 to 20 months, needed some semblance of work, life balance. IHPME at the University of Toronto also remains the top choice for most members seeking to advance their education in health services administration, due in large part to its reputation and the modular format of its programs. Patterson has also found himself in good company with other Canadian Armed Forces Robert Wood Johnson award recipients. His former Commanding Officer, Stephan Plourde, an alumnus of IHPME, received the award in 2004. Now a Colonel, Plourde is a senior Health Services Operations officer and mentor to Patterson.